PULLEY :- Taper Lock Pulley and Pilot Bore Pulley , Flat Belt Pulley, Heavy Fly Wheel etc. V-Groove Pulley in Section A, B, C, D, E, M, Z, 3V, 5V, 8V, and size up to 2000 mm PCD Diameter and up to 20 Grooves. BUSH :- Graded Taper Lock Bush, Graded Flanged Type Bush. 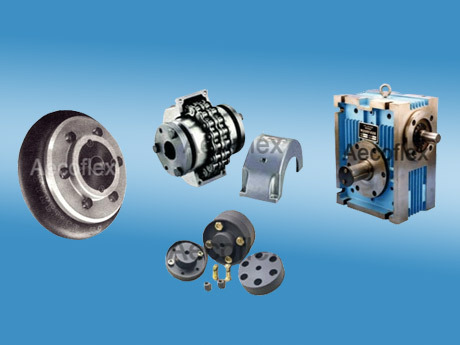 COUPLING :- Gear Coupling, Pin Bush Coupling, Muff Coupling, Tyre Coupling, Star Coupling. All materials are inspected for mechanical and chemical properties by verifying their certificates as per established norms. Quality and Performance being at the first place for manufacturing, we have gained a strong base of customers all over the globe. Our customers provides us with a never ending source of sales as well as ideas for innovative products.